The Bears Pit: v1.13 General Development Talk » VS 2017 Solution Compiles .lib? How can I create the exe? Home » MODDING HQ 1.13 » v1.13 General Development Talk » VS 2017 Solution Compiles .lib? How can I create the exe? Hey folks, on the latest SVN version of GameData, and the latest compiled .exe I could find (8555), I am experiencing a game-breaking bug where I can no longer select mercs or groups, or click cancel, on the Strategic Map screen. The list on the far left is clickable, rest of the UI is responsive, but the small dialog when selecting a merc or a group in a sector cannot be interacted with. Thread for that is here http://thepit.ja-galaxy-forum.com/index.php?t=msg&goto=353310&#msg_353310. In trying to debug this issue (programmer by trade) I grabbed the latest Visual Studio 2017 CE, downloaded the SVN. Everything seems to build fine, but the VS2017 solution file (also tested 2010) is set to compile to a .lib instead of an .exe - can anyone shed any light on how to compile as an exe? I haven't had that ever, so no good idea... but perhaps this setting might help? Also check what your output dirs are in general, they sometimes get set to odd locations when someone forgets to untick a file in svn. Got it! Noob mistake, I think, not yet used to VS2017 - needed to select JA2 specifically, looks like I had somehow selected the VFS portion of the project, which is set to build a .lib. Same thing happened when I tried to start "Local Windows Debugger" via the Play button - it tried to run VFS.lib and failed. I was able to fix this by selecting the JA2 folder, right click, "Set as default", then attempting to build the whole solution. I can debug line by line now, I believe, but most of the beginning of the startup of the game shows as external code, takes a lot of F10ing to get even to the title screen. There are a ton of .cpp files - trying to figure out where I can set a breakpoint in order to be able to run normally up to the point where a game is completely loaded. 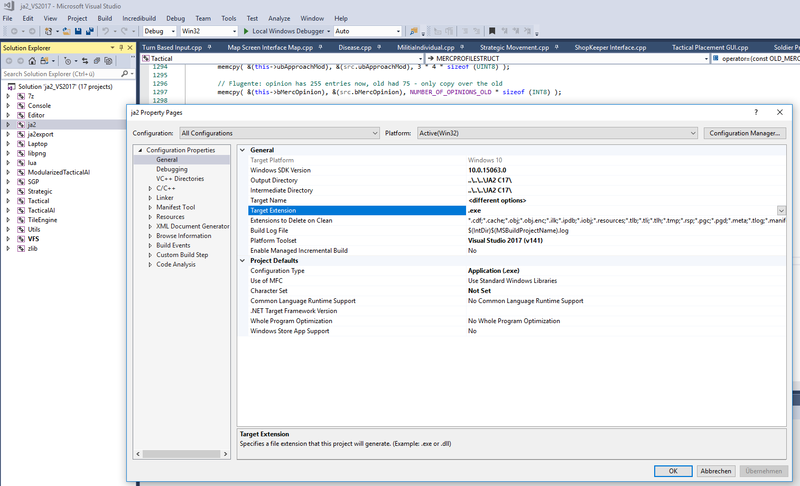 Has anyone else had success in setting breakpoints and launching via F5 from Visual Studio? I've also not had success with the Visual Studio context menu feature "Run to Cursor". I did have success finally by using "Break All" and am now finally stepping through the rendering code for the popup box in question. Previous Topic: Level Progress too fast? Next Topic: Food drop in 1.13?